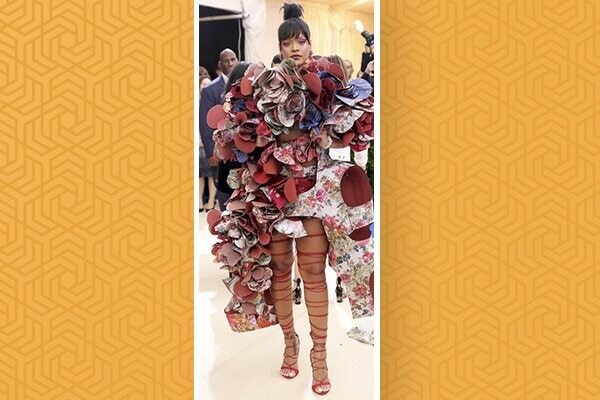 Rihanna’s outfits at the MET Gala surprise us every year and this year was no different! She looked like an exorbitant bouquet of flowers in this outfit, something that only she could’ve pulled off! Take a bow kween Riri! That definitely is one wacky outfit. Ranveer Singh became a hot topic of discussion when he showed up in, what everyone called the ‘condom’ outfit, for Shahid Kapoor’s birthday party. As always, he was super confident in an otherwise awkward looking outfit. But he’s Ranveer Singh and wacky outfits are just his thing. It goes without saying that we love his crazy but amazing outfit choices. How could we not include her on this list? The singer took wacky to a whole new level when she wore this ‘Chicken Dress,’ faced the paparazzi and walked around comfortably. Given that she’s always on her own trip and repeatedly breaks the internet with her insane outfit choices, we had a hard time picking out her wackiest outfit. Another singer whose DGAF attitude we love is Katy Perry. 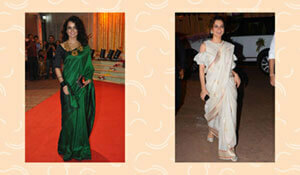 Be it hairstyles, hair colours or fashion, Katy is always making choices that rank high on the bizarre scale. 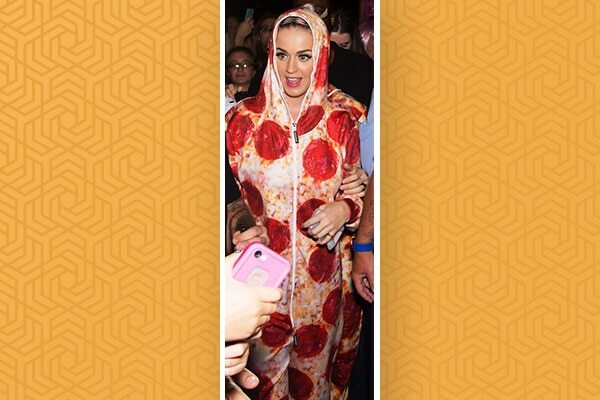 This specifically is our fave, a pizza onesie that she sported like a boss, and even hilariously zipped up when the paparazzi annoyed her a bit too much. 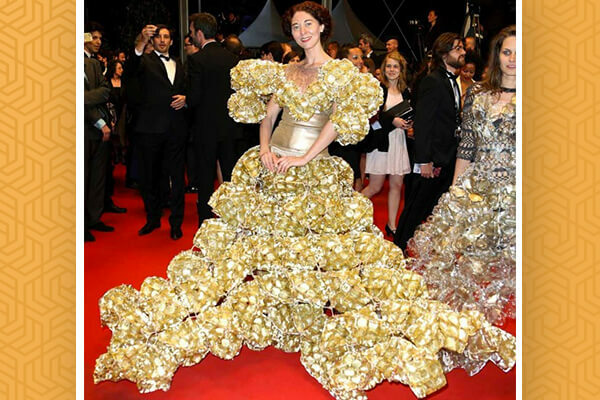 This fashion designer wore a gigantic piece of popcorn as a dress for the Cannes Film Festival in 2013. This dress is her own design and is actually made from biscuit trays (what?) We can only wonder how she sat down, walked around and went to the loo in that dress. Completely wacky! 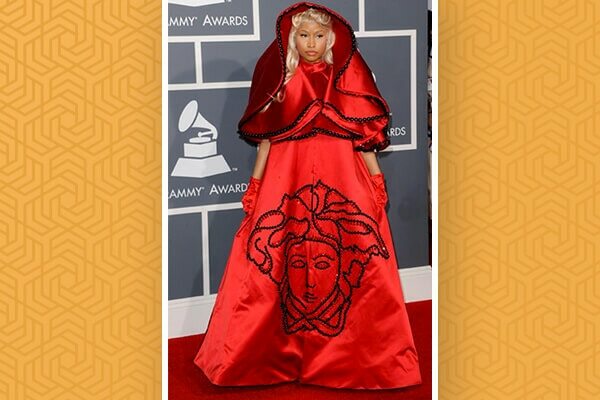 Nicki Minaj made everyone go WTF when she showed up at the Grammy Awards 2012 in this red silk cloak dress from Versace. She looked fierce and so in character for whatever she was trying to be (we wish we knew). Looks like it’s not just her music that’s wacky.